With pocket in the back cover to secure the writing pad and large, triangular pocket inside front cover. 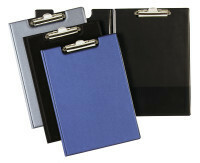 Clipboard with clip spring ideal for holding and supporting documents. Made of recycled aluminium with aluminium lacquer finish. 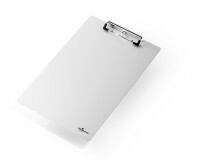 A4 clipboard with strong, anti-slip sprung clip, a pocket to secure the back of the writing pad and a pull-out suspension eye. 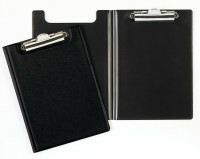 Clipboard with a cover that opens from the side side to hold and protect loose sheets. Made of recycled aluminium with aluminium lacquer finish. Smooth writing surface. For A4 portrait. Made of board reinforced foil. With large triangular pocket on the inside front cover. Reinforced soft PVC clipboard. With pocket in front cover. 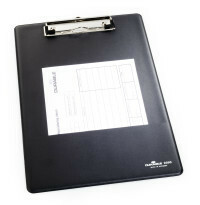 Oversized A4 PVC clipboard folder with black clip. Ideal for use with carbonless form sets. Clipboard with large compartment to store documents, opening at the bottom. Capacity of 25 mm. Smooth writing surface. For A4 portrait.